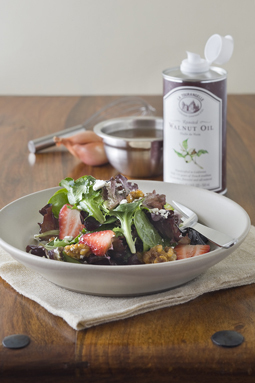 Mixed Greens with Strawberries and Candied Walnuts - A recipe from Savor California, the online showcase for extraordinary gourmet foods and beverages from California. Adapted from a recipe developed for La Tourangelle by Holly Le Du from Bloomingdale's. Put butter in pan and heat on medium till melting point. Add the cumin, coriander, paprika, and salt. Stir to combine. Add the sugar and stir until the sugar is melted and slightly caramelized. Be careful not to burn. Add walnuts and stir to coat them well. Remove walnuts and spread out on wax paper or a silicone sheet to harden and cool. In a bowl, blend together the honey, mustard, vinegars, oils, and 1/4 teaspoon salt. Add the minced shallots. Put salad greens in a large bowl and toss with dressing. Sprinkle ricotta salata cheese, strawberries and candied walnuts on top and serve.